Many thanks to Rob for his contribution in a comment that deserves to be a post. A bit off topic, but helping sailors. 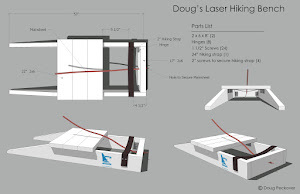 I promised I would send this data to Doug (not sure if Pam was present at the time). I have just returned from Hyeres and was reminded of my promise by a photo on Thom Touw showing a master death rolling and doing it incorrectly. Neither of these film clips were posed or acted. This is about 12 knots, Note position of rudder (central) and how Mitch is holding the main sheet. Nice and fast. Mitch starts an up turn to get speed to catch a wave. You see him sheet in and accelerate. Almost immediately he bears away to take advantage and jump to the next wave. He dumps the sheet but does not bear away enough so the boat begins a death roll. He moves to lee trying to bring the boat upright, but sheets out (now the boat wants to bear away more) instead of sheeting in. He also pulls the rudder so as to luff up. This action tips the hull over to windward even more and he goes in. He might well have saved the capsize by sheeting in instead of out during the death roll and also bearing away violently. Saving a death roll. Running, rudder central (good) but the main sheet from the block. This is not as fast as Mitch. (He is very very much faster than me, particularly downwind). Here the scenario of an up turn followed fast by a down turn is the same. The wind was a bit heavier (15 knots). I was under sheeted anyway as the stopper knot on the main sheet made the boom go out too far. The up turn is ok, you see the boat accelerate. Immediately I dump sheet to do the down turn, but because the stopper knot is in the wrong place, the boom goes too far and the boat starts to go over to windward. 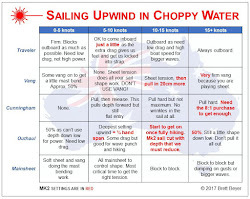 Because I have the main sheet from the block, as I move to leeward, I tighten the main sheet (good) and note how the helm is in bear away mode, not luff up. The boat is not responding so I push the rudder hard and the boat comes upright. If I had pulled the rudder, I would have gone in. See how the water flows into the cockpit. Think of the boat half over to windward. The rudder blade is only just in the water. 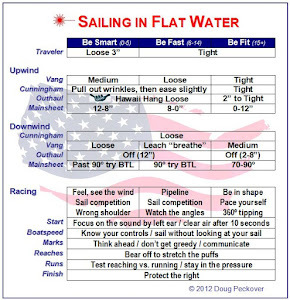 If you pull the rudder, lift the transom up and twist the boat and increase the tipping motion of the death roll. If you push the rudder, you sink the transom and twist the boat decreasing the tipping motion of the death roll. You may have to play the movie at super slow or single frame to see the sheeting and rudder positions. Thanks to Steve Cockerill for showing me how to do it.